If you haven’t had the opportunity to watch Roger Sutton, of the Horn Book Reader, as he interviews reknowned children’s novelist Richard Peck than you need to check it out (see below). It is a fairly lengthy interview but Peck has a lot of worthwhile things to say to those who write for children. As an adult writing about a newsworthy topic (such as gay marriage), you need to be careful not to preach. Peck deals with this by always employing a youthful narrator. This keeps the adult author from stealing the show. That said, Peck also warns us not to write with complete sympathy. Parents are for sympathy. Young readers need writers who are willing to tell them hard truths including the fact that not everyone is gifted. Writers can make even tough truths palatable by delivering them with a big spoonful of humor. This is how Peck created The Best Man, a book about being gay and gay marriage that is synicle and funny and true, but without the tragedy of the earlier gay novels. There is so much more than this in the interview including tips on how to keep modern technology from destroying the tension you need to build a story. I’ve always loved Peck’s books, but after this interview I may have a fangirl thing going on. Is your writing a priority? I always say yes but I’m not sure that that has been true this past month. My dad has been in the hospital twice. He’s now in rehab. We’re looking for new housing for him. And I had to get my son registered for high school. It seems like no one will do anything without contacting me first. And an hour of every morning is spent with my Dad. “You need to write in the morning,” said my husband. So with this very strong suggestion I planned to come home from yoga and shut myself in the office for 90 minutes to draft a chapter. That’s it. Ninety minutes. But the moment I walked in the front door, the phone was ringing. “This is where your dad lives, we want you to send this text and work this out . . .” There followed 4 phone calls and no less than 25 texts. Yes, I found the information and told the last person in the chain where to find it. I’m not sure why I’m the one who has to do it. In fact, they’re being paid to do it. I’m just acting as the messenger. So I finally announced that I was going on radio silence. Anyone else who calls will be told by a dining room full of teens that I’m in Australia herding wombats. I posted it on Facebook. Then phone rang. “She’s in Australia…” said one. “. . . herding wombats,” yelled the rest. Five teens, one Facebook post about Australia, and a spot of time and I’ve finally drafted my chapter. Sometimes making your writing a priority is really difficult. But you need to do it. Don’t take a page out of my book and wait to get permission from your spouse. Post something on Facebook. Put all of the phones, including your cell, in another room. And, if you need, I’ll loan you one of the teens. They love relaying messages about herding and wombats and wack-a-doodle writers. Audio Book: Do you consider this possibility as you write? I’ve been thinking a lot about audio books lately – what makes a good audio book and what doesn’t. In part, this has to do with my recent listening experience. My family listened to The Blackthorn Key on a recent road trip. Excellent book. Actually it was perfect for the three of us because it combines science, history, a mystery and codes. What more could you ask for? Apparently, you could ask to see the code vs hear the code. When the voice actor gets to the coded message, he reads it character by character. That means that you get line after line of “YYEGQRLZ(pronounced zed)” and more. Yes it is fairly amusing when the oh-so British narrator says “zed” instead of “zee” and “full stop” for period. But over all listening to someone read line after line of code is tedious. And that when the code is in English letters. It gets even stranger when it involves “sword pointing down,” “triangle up,” and more. I have to admit that it has made me look at story a bit differently. I catch myself thinking “how would you read this aloud?” That applies to codes, tables, schematics and more. Granted, some of these things matter more in nonfiction than fiction but they do matter. I can’t even imagine trying to explain the Mayan number system without a diagram. Granted the diagram I provided my editors wasn’t gorgeous but I did provide it because I knew they would need it to understand my text. And then there’s the Mayan system of interlocking calendars. In the past when I’ve failed to love an audio book, its been because the voice actor grated on my nerves. Sometimes the person’s voice was too flat and without inflection. Other times it was just whiny and … eeeew. This is the first time I’ve ever encountered a book with lengthy coded passages that just left me wondering what was going on. This makes me wonder if some books simply aren’t made into audiobooks because graphics or other elements wouldn’t lend themselves to this format. No conclusions, just something to consider as I write. I love it when I find interviews with fellow authors. This week, I discovered Library of Congress interviews with nonfiction author Tonya Bolden. When I was reading the description of her book Capital Days : Michael Shiner’s Journal and the Growth of our Nation’s Capital, I was thrilled to see that she is known for illustrating our nation’s history by focusing on the story of a single person. Anyone who knows me knows that I love this type of history. When the students asked Bolden how she begins a project, she told them that she always start with a panic along the lines of “can I pull off this story?” The reality is that each book she writes presents unique challenges so she can’t say “this is do-able” based on the fact that she’s already written a large number of books. That said, she always calms down when she starts to do the research and sees the story begin to emerge. Like me, she goes back and forth between research and writing. As she writes, she discovers blank spots in her research but she doesn’t let this stop her writing. Instead, she marks each of these things with TK. She explained this as meaning “to come” although she says that as copy marks go it doesn’t make sense, but believes that the combination isn’t found in any English word so you can use it and easily search it out in a manuscript. She researches, writes with a lot of TKs, and then goes back to discover these details once she knows where the story is going. One resource that she recommends for those who write history is a subscription to Geneology. This subscription allows her to read historic newspapers online. That said, this access comes with a warning. With so much information available online you have to be careful not to get lost in it and never come out to write. For more tips from Bolden, be sure to check out these LIbrary of Congress videos – Every book begins with a panic, Research skills, and History benefits us all. Personally, I’m waiting to get a handful of her books from the library. Last night we watched an old episode of Bones. They were trying to solve the murder of a body builder who had been partying on the Jersey shore. For those of you who aren’t familiar with the show, the main character, Bones, is a forensic anthropologist who is brilliant but beyond literal. Because of this, she and the real world often don’t see eye-to-eye. To solve this particular mystery she and her partner had to question “Guidos” and she had been watching a documentary to learn about their vernacular and customs. Fascinated by the Guido tribe, she dove right in to participant observation mode, interacting with them as one of their own. She used their phrases, “Yo, bro!” and “Oh, no!” in particular complete with the correct body language. The problem was that back in the lab she would sometimes pop off with one of these phrases. It may have been a perfect fit on the Shore but back in the high-tech world of the Jeffersonian, it was a bad fit with a comedic result. The lesson? Be careful when you create the voice for your character. You don’t want your Union soldier to sound like a pirate — unless your end goal is to have my teen son imitating your character for all to see and hear. You don’t want your teen age boy to sound like his mother. The exceptions? When you are using it for effect. Maybe you are showing us what your character loves or is interested in. Maybe this is a clue about their early origins and they’ve carelessly slipped back into an earlier speech mode. Maybe you’re pirate longs to attend Oxford. Yes, you can do it for a laugh, but you have to create a reason for your character to be speaking like this. Otherwise, it just seems off. Lately I’ve been thinking about antagonists because one project stands between me and getting back to my middle grade science fiction novel. One of the problems that I’ve identified is my villain/antagonist. I say villain/antagonist because in the original outline he is a first class villain. He’s bad through and through and doesn’t give a rat’s rear who knows it. The problem is that he’s also the stepfather. My concern was that I had created a play on the stereotypic evil step-mother. So I played around and came up with a slightly different version. Unfortunately, I think he’s too sympathetic. With this version I don’t have an atagonist standing against my protagonist. I have a misunderstanding. What I need is a compelling, dark villain. I need a Loki. 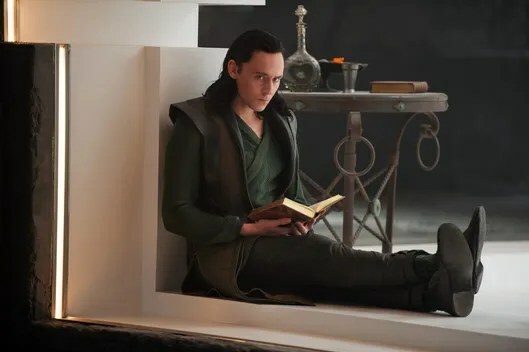 I adore Loki and why came together as I read Gillian Bronte Adams’ post. I have to come up with a motive that sets the stepfather against my protagonist. It can’t be a dippy, shallow mustache-twirling motive. It has to be rock solid. That doesn’t mean that it can’t be a stupid adult motive — the kind of thing that is perfectly logical if not compassionate. But it has to make sense. It has to be the kind of thing he could defend even if his stepdaughter things it is wicked in the extreme. The final nudge from Adams’ is to give the antagonist humanizing details. As she points out, Captian Barbosa in Pirates of the Caribbean has the apple he holds in his hand. He longs for it but he can’t truly taste it or be satisfied it. Yet he holds on to it. I’m not sure what this detail will be for the step father. The big problem with that is that, in this version, he is largely off screen. We don’t see him except through the words of the protagonist. That might have to change so that I can work in those human details. Off to mull over solutions to my ho-hum lackluster antagonist. Last weekend when I was at the All Write Now! Conference, I witnessed my first slush pile reading panel. It’s a little different from a first pages panel and works like this. Conference participants get to turn in the first three pages of their manuscript. During the session, the reader pulls a manuscript and then reads. The panel, in this case mostly editors and agents, listen and when someone would stop reading he or she raises their hand. Three hands up and the reader stops. All of the manuscripts made it through the first page. Many made it through the first three. It was interesting to listen to the various panelists react to the manuscript. Some of them told why they quit reading. This was especially interesting when one person quit before the others. Don’t start with pure action. If you do, the reader doesn’t know who the character is. If the story is first person, they may not know gender, let alone age or anything else. The reader has to care about the character and know what is at risk before they can really care about what is happening in the story. Just as you can be too general, you can be overly specific. Every time you mention the character’s car, we don’t need the model and color. Summaries are a way of telling vs showing. So are flashbacks. If you have a flashback in the middle of chapter 1, trying moving it to the beginning of the chapter. One of the most important things that I saw here was how subjective it all is. One person might quit reading long before the rest of the group. Even when three people raised their hands, they did so at different points, some reading much more than others. The lesson? Prepare your best work but understand that you may need to send it to many, many agents to find a good match. Too bad I’m not writing a book set in the 1970s. Hmm. Maybe I should just shift the date on the Cold War mystery. I’m not too far to do that. I’ve gotten to do some extra research this week. Why? Because while I was out yesterday our internet went out. When I got home, there sat my 17 year-old waiting for someone to hear him gripe. The problem is that our “data is bundled” or something like that. No internet. No phone. Couldn’t even Google on my cell phone. For 24 hours, I had a computer but no online access. It was just like the computer my dad brought home when I was in junior high. I could word process but I could use the online dictionary. I could write this blog post, but I couldn’t search for an image to go with it or post it. But the crazy thing was that we suddenly seemed to have more time on our hands. We watched something on TV (thankfully we still use an antenna for that) and we each got a lot done around the house. I’m almost caught up folding laundry. My son did scads of chores. Scads. He said that word a lot. I read a book. I didn’t get as much writing done as I would have liked because I just finished a job. That means that everything I might work on next is in the early stages. Even my fiction is pretty fact dependent so everything is in the research stages. Amazingly, I’m pretty darn internet dependent when it comes to my research. Yes, I could go to the library but I’m not entirely willing to leave a house full of kids on their own. Besides, it’s kind of fun listening in as they entertain themselves old school. They’re playing D&D (Dungeons and Dragons for the newbs among you) and my dining room table is spread end to end with manuals – Players Handbooks, Dungeon Master’s Handbooks, Monster Manuals and more. It’s a pretty awesome way to spend the day. As most of you probably know, an elevator pitch is a 60 second pitch, something short enough to share on an elevator ride. It needs to hook the agent or editor and make them want more. Hint: Saying that you don’t know how to describe your story is not the way to go. If you can’t describe it, you probably aren’t familiar enough with it. Be sure to create a pitch that is clear, no matter who are targeting with it. This was brought home for her when she included the acronym AA in a pitch at Frankfurt. After she had given the pitch several times, someone pointed out to her that European agents might not know that this stands for Alcoholics Anonymous. Know your audience! Speaking of audience, your elevator pitch should be customized. This means that you should have several versions. Now which won will appeal to a trade fiction editor at a major house vs an editor from a religious publisher. Know what a specific editor will be looking for and be ready to deliver. But it still needs to sound conversational. After all, you’re having a talk. Your pitch shouldn’t sound rehearsed although it should be rehearsed so that you know what to say. Be sure to practice sounding relaxed. She had a slightly different set of advice for nonfiction authors. Those who write nonfiction should start with a bit about themselves and then the story. Unfortunately, the pitch that I developed for my nonfiction story doesn’t do this, but I like it. Pukology is early middle grade nonfiction. The ins and outs, whys and whens of vomit from how it works and why its necessary for life in people and animals from prehistory to the present. What would you do differently to pitch this story? This Saturday I was down in Cape Girardeau for the All Write Now Conference put on by that chapter of the Missouri Writer’s Guild. I gave a talk on writing short nonfiction for young readers. I actually gave this talk twice but it is really interesting how participants’ questions lead you into different territory. Although it started out the same, it turned into two very different presentations. In addition to speaking, I got to attend a keynote workshop on elevator pitches, a slush pile session and an inspirational session by memoirist David Amand. At lunch at sat beside another presenter, Liz Schulte. I wish I could have attended her session on self publishing — she has something like 22 books out and this is what she now does for a living. We chatted about self-publishing and what I write. I’ve never heard a self-published author discourage self-publishing before but she explained that my books with ABDO probably would never have made it in the world of self-publishing. They sell well because schools and libraries buy them and these markets buy them because of ABDO’s reputation. That said, some of my other work might do quite well self-published. Something to noodle over. I also critiqued manuscripts in addition to speaking. One of the manuscripts I critiqued was also presented in the elevator pitch session and the author won a critique of ten pages by agent Jill Marr who is with the Sandra Dijkstra agency. That was so exciting and I could see why she won. This manuscript has “baby boomer high concept” written all over it. Most of the events that I attend focus on children’s literature and it was interesting to hear what other writers are doing. I’ll be writing more about the conference throughout the week. If you ever have the chance to attend this event, I’d definitely recommend it!